This entry was posted on Monday, June 13th, 2016 at 2:16 pm. I love a good equestrian romance with a hunky cowboy – who doesn’t? In The Reins, by new author Carly Kade, has it all: new beginnings, fun characters, beautiful horses, and plenty of enticing, steamy scenes at the stable! Devon Brooke, journalist and freelance writer, makes a break for it when she leaves her fiancé and the big city in one fell swoop. She follows her heart and finds herself back where she belongs, out in the country with a new horse to love. When she moves Faith, her Paint mare, to Green Briar Farm, she is just looking for some peace and quiet, a chance to rejuvenate and focus on herself again. But peace and quiet isn’t in the cards because she soon meets McKennon Kelly, the resident hottie cowboy. McKennon, a trainer who has a way with horses, begins working with Devon and Faith, so their relationship is strictly platonic. But Devon would be lying to herself if she didn’t admit she wished McKennon would take things to the next level – but something from his past – a secret no one wants to share – is stopping him. Devon also meets JD McCall, a young rodeo star wannabe, and the two become fast friends, (although JD makes it known that he’d be okay with being friends with benefits)! But again, there is something fishy in the water at Green Briar, and Devon is in the dark. Even the owner of the farm, Sophia’s, lips are sealed. There’s nothing for Devon to do but “mind her p’s and q’s,” and continue to work with and train her young mare. And it’s while working with Faith, and thanks to McKennon, that Devon learns more than just basic horsemanship. “Inside of today’s instruction, the weight I’d been bearing was suddenly gone. All at once, it made sense. I realized I’d been holding back the whole time – holding back on riding my horse, on loving someone, on really living my life. It’s not in the reins. Can’t you just picture that beautiful scene? 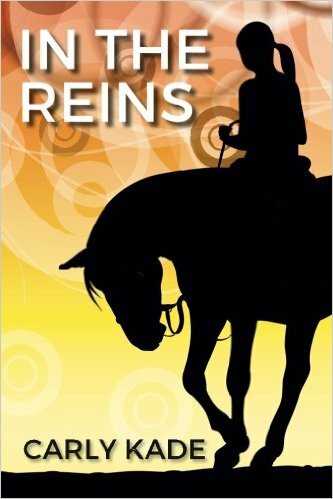 There are many more like it in In The Reins, which is a well-written, exciting summer read. And the good news is…Carly is currently working on the sequel, so Devon and McKennon’s story will continue! Also – stay tuned for an author interview with Carly! You can purchase In The Reins at Amazon here, and you can learn more about Carly on her blog here. Enjoy! !